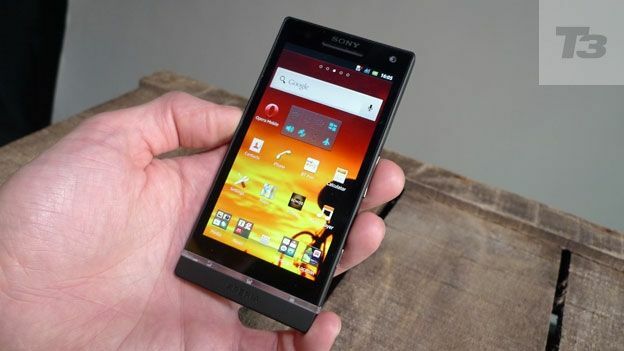 The Sony Xperia S is the brand's first smartphone since it parted ways with Ericsson. But has it got what it takes to take the Android crown? As tech consumers, we've currently got a rather odd 'problem': there's just too much good stuff out there. Nowhere is that more true than with phones; the adoption of Android, fast processors and uniformly smart looks means it's hard for anything to stand out. Take this phone, for instance. The Sony Xperia S is very fast, slick, has a large screen without feeling too big and does just about everything you need from a modern smartphone. It's in the top tier, yet it's weirdly hard to get excited about because there are so many other good phones either already available or imminent, including the Samsung Galaxy Nexus and the LG Optimus 4X HD. Does it really have enough to make it into our list of the best smartphones around? First up, the 4.3-inch screen with Bravia tech - this phone is festooned with big hitting Sony tech sub-brands, by the way. It's extremely vivid and bright, whether you're looking at video, photos or surfing the web. Some of you may prefer the more naturalistic look of, for instance, the Apple iPhone 4S's screen, but for anyone hooked on OLED displays, this is the nearest LCD has got to that kind of vibrant, luminescent psychedelia. As a result, on the screen, two- to 12-meg photos and 1080p movies shot on the Xperia S' camera have a slightly hyper-real quality. Whip them off on to a TV or computer screen and they look more conventional, but still of very high quality for a phone, being detailed, bright even in low-ish light, and with decent sharpness. The camera also has a dedicated button and is ready to shoot in pretty short order. All told, it's better than the Samsung Galaxy S2 and up there with the iPhone 4S. Arguably the iPhone's photos across a range of different shooting conditions are of slightly higher quality, but the Xperia S has a number of extra, useful features, such as a timer, and less useful but fun stuff such as 3D panoramas. And it has more megapixels in it, which is, of course, essential. Design is one of the areas where the Sony Xperia S falls down. The Android buttons are unresponsive and hard to find, the feel is solid rather than inspiring, and the one little flourish - a see-through, light-up strip below the buttons - is just naff, really. One day, the built-in NFC capability will turn the S into a travel pass and debit card. Right now, you can exchange documents with it and scan tags. So tap it on the “bedroom” tag and Wi-Fi, Bluetooth and the ringtones turn off, while the alarm app turns on. For some reason, tapping again in the morning doesn't have the reverse effect. Tags are user-programmable, though. Phones are now essentially platforms rather than standalone gadgets, and the Xperia S delivers as a source of games, movies and music. Google Play (formerly Market) is second only to the App Store as a retailer of software nuggets, and having cut loose from Ericsson, Sony is also unleashing its full arsenal of entertainment options, with PlayStation certification, Music Unlimited and Video Unlimited. Music Unlimited is a subscription-based Spotify clone. Video Unlimited is not a Netflix-style subscription service but actually an iTunes-style buy/rent one. Presumably "Video Unlimited as long as you keep bunging us 2 or 3 quid a time to watch said Video" was deemed to have not quite the same ring to it. As you'd hope from the Walkman men, Sony's music app is great. Cover Flow-style album art means it looks good (nobody actually browses their music like that though, do they?) and the audio is a bit like the screen in that it is very punchy, loud and vibrant rather than necessarily “accurate” – no bad thing, in this case. The video and music options both offer a decent selection and pricing on a par with their rivals. We'd still use Lovefilm, Netflix, Spotify and Amazon's MP3 Store before either, mind. The PlayStation "certification" and associated app are what should really make Sony phones stand out, but the whole thing remains pretty half-baked. Are people really gagging to play the crusty likes of Crash Bandicoot on their phones? There's promise here, but not much delivery as yet. However, things can only get better, and there are plenty of non-Sony titles at Google Play (the app store formerly known as Android Market), with the 1.5GHz dualcore and 1GB RAM well up for 'em. We're a little disappointed that the OS on board is ropey old Gingerbread rather than thrusting, virile Ice Cream Sandwich - an upgrade is promised "in Q1", so presumably within the month; makes you wonder why Sony didn't just wait a few weeks to release this. However, Gingerbread runs with no lag, offering a level of slickness comparable to the more expensive iPhone and as good or better than any Android phone currently on the market. We also had a few issues with Mac compatibility: we could barely get any music on to it from an iMac running Snow Leopard via Sony's hapless Bridge for Mac software. Battery life is fine. Despite the use of a sealed rather than removable battery you'll need to charge once a day, but that's par for the course. The storage is also 'sealed', in the sense that there's 32GB built in but no microSD - come on, 32GB is plenty. The above niggles aside, there's nothing very wrong with the Sony Xperia S and a lot that's very right. All told, it's probably the best Android handset you can get right now, unless you insist on Ice Cream Sandwich and a massive screen, in which case the Samsung Galaxy Nexus trumps it. We'd still choose the iPhone over it most days, but the gap between Apple's phones and cheaper Android alternatives such as this is being sandpapered down to wafer thinness.